A month ago, I said good bye to my gardening hero. Back in the day, my Dad was a radical organic gardener, a foot soldier in the Crockett's Victory Garden brigade, eager to upend the typical grass dominated suburban quarter acre and create a new Eden. He did it in no time flat. He told me his first attempt at a vegetable garden was a "100% failure" but I have no memory of that. All I remember is Dad pushing his red wheelbarrow, creating elaborate multi-sectional compost piles or hacking away at the worthless sod, making way for new beds. 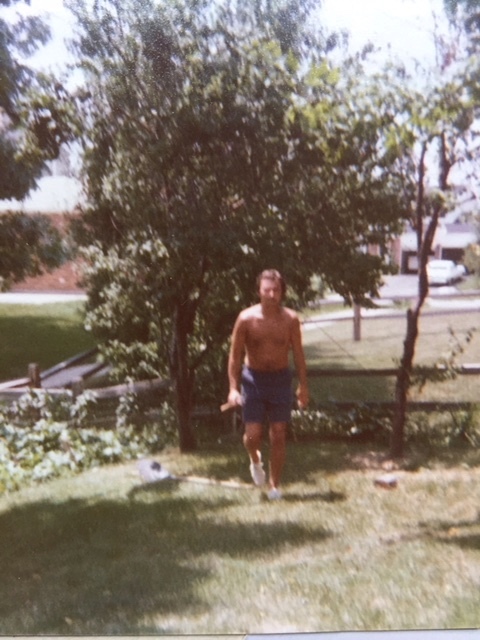 If it was summer, he was shirtless and brown as a nut, taking only an occasional break for a glass of ice tea with extra lemon and slices of one of his tomatoes, watermelon or kohlrabi, all with salt. If it was winter he was sitting on the couch with graph paper and seed catalogs; planning and fidgeting until the moment he could set up grow lights in the garage and start all over again. 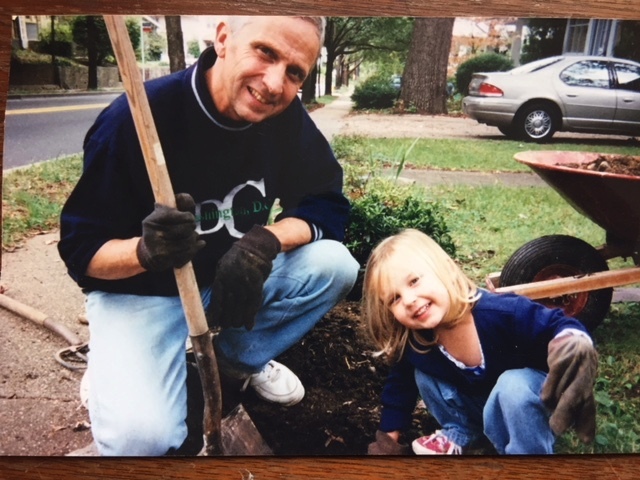 My Dad and Daughter, transforming my front yard, circa 1999. When every inch of that home was landscaped, Dad moved Mom and his wheelbarrow out to the country, to a house with two full acres of lawn, begging to be turned into a rose garden, an herb bed, a vegetable potager, an orchard and bed after bed of annuals and perennials, ornamental grasses and vines. All but the rose garden was organic. For ten years he loved on that house until this past winter when the cancer had advanced so much that even setting up grow lights wore him out. Still, by that time he was a local legend. A professional landscaper stopped by last week to tell me how jealous he got every time he drove by. He called Dad's yard "a showroom." He offered to buy the house for his son, also a landscaper. So how to say good bye to a garden legend? Luckily I found a like-minded spirit at a florist in his home town who not only listened to all my weird demands (please find local flowers, please don't use floral foam), but actually read the obituary and saw that my Dad belonged to the Audubon Society and deduced that adding bird motifs to his funeral arrangements would be a good idea. Katie of Ivy League Flowers in Greenville Ohio was spot on and I love her for it. I can only hope we gave Dad the farewell he deserves. When I made a last loop around the yard before I left last month, I marveled at how the beds really were ready for spring planting and weeding, meaning that my Dad, a cancer patient, had managed to cut back the perennials and clear away debris last fall, in between radiation treatments. That's some serious dedication. I also noticed his beloved wild birds, dipping between the branches, bathing in chilly puddles in vegetable garden and singing merry songs. A better memorial to his memory I don't think I could ever image.